We’re getting a lot of requests for a couple more drop off points. We’re thinking of adding a Corona del Mar, a Temecula, and a Riverside drop off. If anyone has an opinion about where specifically, in those communities might be the perfect drop off site, please let Farmer Donna know. Welcome! My name is Todd, and I’m helping Farmer Donna to kick off this blogging adventure. With new folks joining her CSA weekly, we thought this might be a good way to get news (and recipes) out in a timely and efficient way and keep everyone well-connected. It’s an ongoing experiment, so let us know what you think, and be prepared to see the blog evolve. I’m excited and honored to help Donna out with this, as I’ve become a huge Morning Song Farm fan in just over 4 weeks. My own story is that I learned about the CSA concept in early August, found her listing on Local Harvest, liked her answers to my endless questions, and signed up for a basket. Each week has brought new surprises with it, and I love knowing where my food comes from. I could go on about the flavor, nutrition and more – but I suspect you already know that since you are here. I’ve included some recipes from Donna’s previous newsletter that were too good to pass up, and the first couple of posts you’ll see below will feature some of the great produce we are now receiving in baskets. If you have any comments or suggestions, please share them – you can click on the “comments” section below any post to add your feedback. Enjoy! Aren’t these melons fantastic? I love just leaving one on my counter for a while because it perfumes the kitchen. Scoop out flesh of one melon, put in baggie or other container and freeze. Put frozen contents in a vitamix or other strong blender. (I’ve tried the cuisinart and it doesn’t work as well). Add the juice of a lemon or lime. Add a little sprinkle of natural Stevia (found at Trader Joes—get the real stuff, not the one that’s been cut with a lot of sugar, because what’s the point?) and then a dash of real sugar for consistency. Puree. If you have a hard time getting the blades to move at first, add a little orange juice. This comes right out of the blender like a soft-serve ice cream. You can freeze it further if you want it harder. For a variation, I take the lime juice separately, blend a few sprigs of mint, then sieve out the mint leaves and use that juice in the sorbet. This is a common green in China. It can be steamed just like spinach, eaten raw in salads, or sautéed with other vegetables. Sautee chopped Bok Choi with sliced zuchinni. Drain. Put in casserole dish. Make 2 pieces of wheat toast. Crumble the toast in a blender, cuisinart (or just your hands) add to the crumble mix a little rosemary, chilantro, salt and pepper. I like to spash a tiny bit of hot sauce. Sprinkle over your steamed vegetables. Add dash of olive oil. Grate a nice, hard cheese over top and broil for a minute or two until done. Eat. You’ve probably heard of it, maybe even eaten it without knowing. 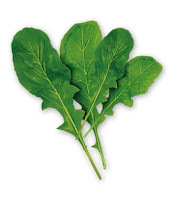 Arugula is a rich, somewhat spicy, leafy green. We love it raw in salads, or lightly sautéed with a little crushed garlic and then drizzled with olive oil. Chef Mark from The Old Vine in Costa Mesa actually flash fries arugula. It then dissolves in your mouth. It’s worth a trip up to see him, just for that. This is a little more complicated than the typical Morning Song Farm recipe, but worth the effort. Put the frozen package of pie shells in the micro for 1 minute unless they’re already thawed. Slap down on pie pans and cut edges away. You now have two empty pies. Throw mushrooms, white part of onions (diced), and 3 crushed garlic cloves in a sauté pan with olive oil and sauté. Dump everything together and pour half into each pie shell. Cook at 350 until done, about 40 minutes in my oven. If you want to bother, you can put a thin edge of foil around the outer edge of the pie so the edge doesn’t get overcooked and dark brown. Put the other pie, partially cooked, in the freezer. If you freeze without partially cooking, the raw eggs get funky. Thaw, finish baking and serve.